The renovation and development of new indoor spaces for a popular nature center in Wellfleet, Massachusetts. Rated LEED Platinum, the building is now as environmentally responsible as the client, the Massachusetts Audubon Society, and can effectively serve a diverse community of both younger and older visitors. The Massachusetts Audubon society has a long history of providing opportunities for people of all ages to grow an appreciation and understanding of wildlife. 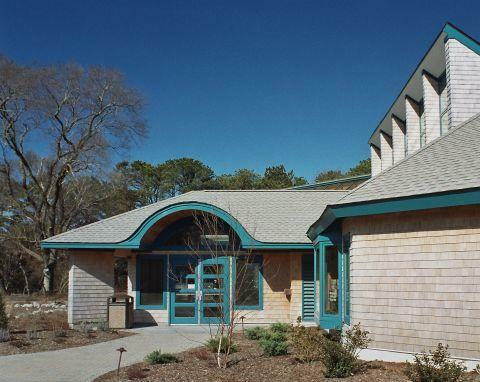 This emphasis on environmental responsibility and education was applied to the renovation of the Wellfleet Bay Wildlife Sanctuary and Nature Center, the fourth building in Massachusetts to receive a LEED Platinum rating. Single-story additions, about 5,200 square feet in total, were added to the existing nature center: a 6,800 square foot 1984 wood frame building with lot. The center was popular among visitors and staff, however, the renovation established an opportunity for the Center to gain LEED accreditation and to meet the spatial requirements of the Center’s growing program. The Nature Center sits on a 1,100 acre wooded site by ponds and a tidal bay. Though ample bike parking has been provided, it’s proximity to the highway means many visitors arrive by car. The Sanctuary attracts both tourists and Cape Cod residents, many of whom are older and retired. Children also frequent the sanctuary, especially during the summer when day camps are hosted. The Center houses the reception desk, the Sanctuary Gift Shop, exhibit space, and staff offices. Behind the offices within the building’s new wing are classrooms, an auditorium, and new administration areas for staff involved programs. An additional unheated structure was built for 3 summer classrooms. Principal architect Andrew Miao worked closely with the Sanctuary’s staff throughout the design process. Meetings stimulated communication over the various issues and priorities of the staff, who not only represented themselves but visitors and members. Over the course of the design process, seventeen design schemes were produced until the final partee was chosen by staff members. By October 2005, staff had also developed a blog, Living Green at Wellfleet Bay, to share the process of the renovation with the public. The new entrance of the Center is intended to serve as the nexus of the sanctuary. Walking into the building, users immediately engage with the reception counter running parallel with the entrance doors. A rug acts as a tactile device for leading visitors towards the Sanctuary Staff, and main attractions can be seen and/or easily accessed from this point. Changes in wall color, ample signage, and windows also help users move about the site with clarity. Passive solar and ventilation played a significant role in the development of the new renovation. An abundance of natural light is brought into the space by large windows that run along the walls at differing heights, which also make it easier for people of different heights and levels to access the views. Motorized clerestory windows provide additional sunlight and are used for ventilation purposes. Ceiling fans help circulate the air further and in the summer, louvered bahama doors allow cool night air to collect in the building. One issue of the existing Center was the uneven, multi-level flooring. Rather than installing ramps and rails to create an accessible interior, Miao opted for warped flooring—a technique to seamlessly join the spaces and ease movement between them. Through the open-plan exhibition space, users can access the entry that leads to the butterfly and hummingbird garden and trails. Here, a paving stone path circles the garden and there are benches oriented for viewing. Benches are placed with frequency throughout the many acres of trails as well. Two of the Center’s trails are fully accessible: the All Persons Trail and the Green Building Trail. The All Persons trail runs from the garden to the Goose Pond where a viewing overpass can hold several visitors at a time. According to Bob Prescott, Sanctuary Director, the new renovation has evoked an overwhelmingly positive response from staff and visitors. Many find the new spaces to be quite comfortable: there is plenty of natural light in almost every interior space, and fresh air is constantly circulating throughout the Center. Visitors are often shocked when they walk into the cool building during the summer and find out that there is no air conditioner running. Functionally, the renovation exceeded expectations. Throughout the design process, every one thought about the path to be taken by all users from the parking lot, throughout the building, and down to the Goose Pond. Understanding how this route would be taken by wheelchair users, people pushing strollers, and those using walkers helped make the renovation work equally for everyone. Educational spaces worked well throughout the seasons—especially for the Day Camp children who use the facility heavily during summer months. Staff members are happy to have functional space separate from the public and having offices set behind the reception counter helps maintain coverage. The sustainable features have had a positive impact on the Sanctuary’s working environment. In addition to natural light and ventilation, the choice of using low VOC materials in all areas of the building has allowed interior air quality to remain strong. Of the green materials applied during the renovation, the recycled tire resilient flooring has not met expectations. According to staff, the material is difficult to clean and has been wearing more quickly than anticipated. Beyond its use of environmentally responsible materials and energy reducing features, the Center contributes to the wellness of the site and enriches the users’ understanding of sustainability. The development of a “Green Building Trail” enables visitors to navigate the site by use of a map highlighting the renovation’s most environmentally friendly features. Wayfinding devices engage the senses. Transitions between spaces are marked by changes in flooring materials, graphics and signage, wall color, and, when outdoors, by scent and various other tactile changes. The Center’s simple yet effective plan enhances the user’s ability to move through the destinations with clarity and ease. Single-story spaces with warped wooden flooring along with other level floor materials make the Center accessible for those with mobility limitations. Exterior walls feature large windows for natural light and ventilation. There is ample seating around the Butterfly/Hummingbird Garden and throughout the Sanctuary’s trails. Benches have been oriented towards favorable views. Sustainable building materials were used in all areas of the building. Some of the materials include reused wooden flooring, bamboo veneer paneling, engineered wood trusses, and composite resin counter tops. Passive solar and ventilation strategies are enhanced by motorized monitor windows, high performance ceiling fans and efficient daylight colored fluorescent lighting. Louvered bahama doors also aid in the circulation of cool air. Composting foam toilets use a fraction of the water of a normal toilet and the composted waste can be mixed into the soil for flower beds over time. Curved hallway linking the exhibit hall, auditorium, and classrooms creates natural cooling in the summer as its windows are always in the shade. Native and low water use plants. Four rain water collection tanks with a capacity of 1600 gallons. Collected water is piped underground for irrigation of the hummingbird and butterfly garden. Roof features air locked and reflective shingles as well as skylights that assist as a passive solar element. Photovoltaic solar panels produce 21kW, approximately 30% of the Sanctuary’s energy. The Nature Center is sited to maximize solar energy, minimize environmental disturbance and comply with the environmental regulations. Name: Chris Grant, Superintendent; Nicole Rosa, Project Manager. Company: J.K. Scanlan Co., Inc.